Arc flash is arguably one of the most topical issues being discussed in the electrical engineering community in Australia. Technological and improved safe working procedures have reduced many electrical injuries however incidents related to arc flash have surfaced as one of the leading causes of injury and death to workers. Elliotts are an experienced manufacturer of personal protective clothing for the electrical utility industry. Elliotts were the first in Australia to develop and manufacturing switching clothing and arc flash protective clothing for Australian conditions. Elliotts popular styles of switching clothing are now available ex stock. Meets standards forhigh visibility - AS/NZS 1906.4:2010 Retroreflective materials and devices for road traffic control purposes - High-visibility materials for safety garments. The UltraSoft® line of flame resistant 88% cotton/12% high tenacity nylon fabrics is guaranteed flame resistant for the life of the garment in either high temperature industrial or home washing procedures. The fabric is engineered to focus the excellent abrasion resistance of the nylon on the outer surface to enhance garment wear life, while the cotton fibers are focused towards the skin to optimize comfort. In addition, UltraSoft® fabrics are engineered to have an extremely soft feel to further enhance the superior comfort properties of cotton. UltraSoft® fabrics are fully flame resistant and the 12% nylon actually enhances the protective performance in some cases, such as electric arc and flash fire exposures. 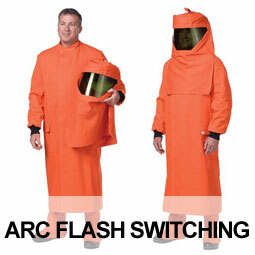 For more information link to range or visit the Elliotts Reference Centre for more information on Arc Flash and other materials including Banwear.